If you are currently pursuing or even just thinking about pursuing the Force.com Advanced Developer Certification, I strongly suggest you check out this video. 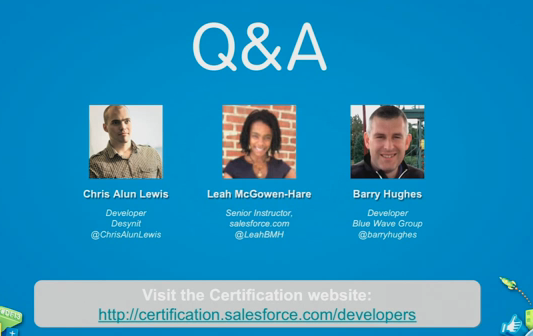 It is a recording of a panel discussion held at the most recent Dreamforce (late 2013), in which 3 people (seen in the image on the left) who have recently passed the Advanced Developer Certification shared their personal stories. All three of the speakers had very different backgrounds and experiences in which to share. They each explained why they chose to pursue the certification, as well as specifics about how they studied for the exam and prepared for the coding assignment. Prepare for the essay exam by keeping notes and commenting your code as you complete the programming assignment. Make sure when you do your unit tests, that they include tests for positive, negative, bulk and specific profile scenarios. Schedule the essay exam when you have the development for the programming assignment nearly finished. You do not have to wait until after you submit it. When taking the actual essay exam, DO NOT try to copy and paste answers from one section to another. If you do, the testing software will deliberately erase what you typed and you will have to re-type it all (or madly find a proctor to get it back, as Barry ended up doing). Practice as much as possible by going through all of the workbooks available to you on DeveloperForce. Take as much time as you can for the programming assignment and start as soon as you receive it. You will only have 4 weeks to complete. It took the panelists an average of 40 – 80 hours to complete the programming assignment and all had to do it in addition to their regular jobs. Focus heavily on creating good test code for your programming assignment. If you have not already run across this document about the Road to Advanced Developer Certification, I strongly suggest you read it too. I love this article! I am looking towards that being my next cert. You mention the workbooks (which I adore btw) is there 1 link for all in Developer or do I need to search subjects and will find the workbook? These two are perhaps the most critical for this particular exam. Good luck on the exam. Let me know how it goes.